Sit back, relax and... prepare for landing. Emirates has launched the world's shortest scheduled service on an Airbus 380, flying between Dubai and Doha -- a distance of 379 kilometers (235 miles). The outbound flight Thursday took one hour and 20 minutes including boarding and disembarking. It was even shorter on the return -- just 70 minutes. The time in the air is around 40 minutes. The airline says it launched the service so that customers flying to the capital of Qatar from New York or European cities via Dubai "can now enjoy a seamless A380 experience." But they'll still have to change planes at the world's busiest international airport. And first or business class customers won't have much time to enjoy their flat beds or the shower spas on board the double-decker. They may just manage to flick through the 2,500 channels available on wide screen TVs. The round trip would cost about $230 in economy, $575 in business and $1,425 in first (or nearly $36 for every minute in the air). The Airbus (EADSF) plane operates on 102 routes to around 50 destinations globally. It took 15 years to develop at a cost of $25 billion. 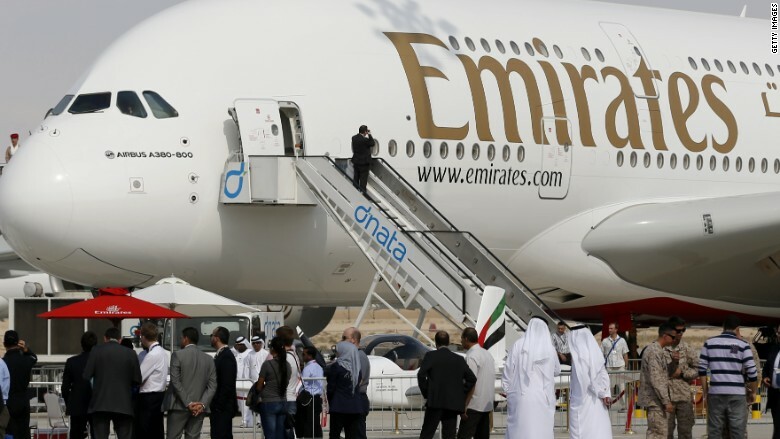 Emirates has 87 of the super jumbo jet in service and 55 more on order. It also operates the longest non-stop flight on an A380 between Dubai and Auckland, New Zealand, with journey time of just over 17 hours.